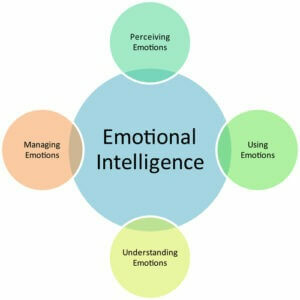 A diagram focusing on emotional intelligence. Photo courtesy of Shutterstock. During the selection process, hiring managers are usually interested in education, skills, experience of the job candidate and cognitive abilities. Another key indicator of success in the workplace is emotional intelligence. Commonly known as EI, emotional intelligence is the ability of a person to identify, evaluate, and manage personal feelings and those of other people, as individuals or as groups.